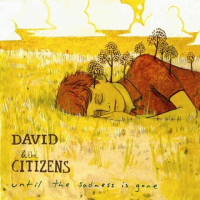 It appears this little album by David & The Citizens was originally released in 2003 under the BMG Music Publishing Scandinavia label and was licensed to Friendly Fire via Adrian Recordings in Sweden. It is good to know the history of an album—the roads it has traveled to reach its current destination here in my hands. Listening to Until the Sadness is Gone, it is apparent why the album was released here in the states. It’s pretty good. While it probably won’t hit mainstream, it definitely has the potential to stick in the independent pop scene. 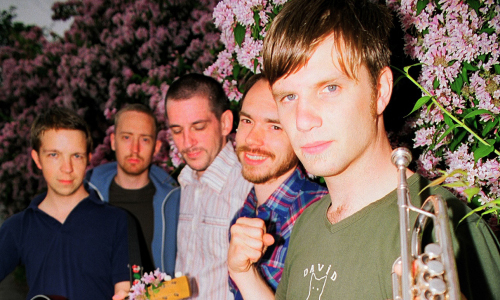 The group carries a rambunctious indie-pop sound that leaves behind much of the typical Swedish pop traits—the calm and oft sweet vocals of many of the Labrador Records artists and the electronic influences rampant in artists on Songs I Wish I Had Written. Their primary Swedish similarity comes in The Lovekevins, primarily because of David & The Citizens use of trumpet. Until the Sadness is Gone opens with “The End”, an upbeat, rapid-paced pop song with a heavy shuffle in brushed percussion and a catchy bass-line. The orchestration is superb in this track and continues throughout the album. “Greycoated Mornings” has a trumpet that resembles the use of the instrument in “La La La Lisa” by Math & Physics Club, while the vocals, for some odd reason, make me think of the more peppy moments of Counting Crows’ Adam Duritz. The title track is another up-tempo song utilizing the now signature shuffle in percussion. The use of orchestration is near perfect in this song, namely in the punchy lines toward the end. “Never a Bottom” slows the album to ballad-pace. It’s a melancholy love song with lyrics like If you ever fall down / I’ll fall with you to the bottom. While these lyrics are a common theme in the verse, the bridge is what makes the song shine, leading the song into a crescendo of sound and sadness. Did I ever take my eyes off the horizon? I wonder if I’ll wake one day to find my life-wasted behind me? “As You Fall (I Watch with Love)” is the most moving song on Until the Sadness is Gone, blending the catchy aspects and orchestration of the faster paced songs with the starkly relayed emotion in the vocals and lyrics of the slower ones. The bridge is filled with the repetition of I’m probably… from better off dead to drunk by now to laughing my head off. It’s a wonderful closure to an album that should have been available in the states upon its original Scandinavian release in 2003. This review was originally published December 28, 2006 on the old version of FensePost. This year, David & The Citizens celebrates the 10 year anniversary of David Fridlund’s original demos. Visit David & The Citizens on MySpace for more. Early 2010, David Fridlund (lead singer and song writer of citizens) will release his new soloalbum. Keep your eyes open for that one.